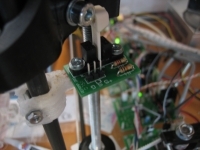 "If I can build a RepRap Darwin, I can build almost any machine." 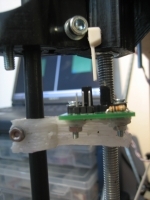 Printed the optoswitch bracket as end-stop for the Z-axis. The part required some cutting and a drill to make the holes (for the screw) that should have been there. Right now, where my RepRap attempts to print a hole (nothing should be there) it prints more than anywhere else: a complete fill with plastic. This is because the outline is really thick and because of the curvature takes longer to process than a straight line. I thought that AngleSpeedFactor might need to be lower, but this didn’t change it much (yet). I’m printing in HDPE, and through the time lapses I made you can clearly see the material shrink causing the warping. If this happens a lot, the object will detach, even with my sandpaper-hairspray combination to adjust the stickiness. Also in this video, you’ll see that the X opto flag is perhaps too thin to print? It doesn’t attempt to print a layer that is too thin? Any ideas? The part was not designed to be printed on its side, which it could be (as a work-around).